Obrigado por visitar a página web da Igreja de Deus Sociedade Missionária Mundial. Você pode fazer login para acessar a área exclusiva para os membros da página web. o nome de usuário nem senha on-line. proteger a segurança de nossos usuários. 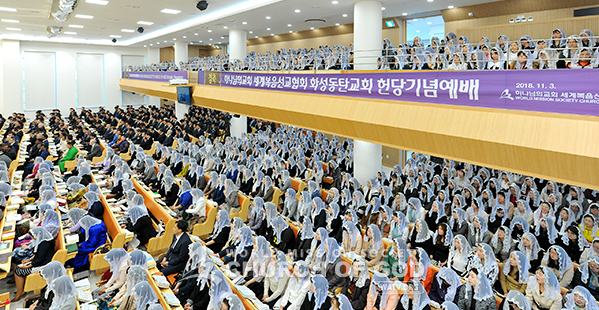 The dedication service for the Dongtan Church in Hwaseong, Korea, was held on November 3. Dongtan in Gyeonggi Province is a representative new city with a rapid increase in the population, as a large-scale residential site and advanced IT and BT complexes are developed. Overseas visiting members too participated in the dedication service on the Sabbath day, and shared joy of dedicating the temple and brotherly love beyond national boundaries. Mother prayed for the temple granted by the love of Father to be filled with the blessings of the Holy Spirit, and eagerly hoped that many souls would realize the truth and receive a new life. Mother thanked God’s children for making efforts to build the temple. 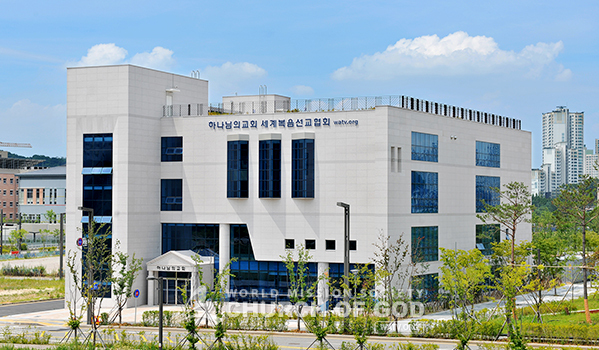 “Citizens of the world will stream to this Zion, because even the members from far off countries have prayed together for the Dongtan Church,” Mother said the words of blessings. The Dongtan Church in Hwaseong, located on the border between Dongtan New City 1 and New City 2, is a building with two stories below and four above the ground. Built in an open area, it is easily seen from a distance. “As in any other newly-established cities, residents are busy and unfamiliar with one another. We hope this new temple will serve as a nest of God’s love for our neighbors who are tired with dry city life,” said the members. “Zions are being established at every corner of Korea. I can feel that there are still many souls longing for the truth of salvation and love of God. Learning from the gospel work of Korea that has grown rapidly, I’ll preach the gospel quickly and set up the flags of Zion across Australia with a population of 24 million people,” Pastor Yun Dae-won from Sydney, Australia, who participated in the dedication service with overseas members expressed his determination. © 2010 da Igreja de Deus Sociedade Missionária Mundial. Todos os direitos reservados.